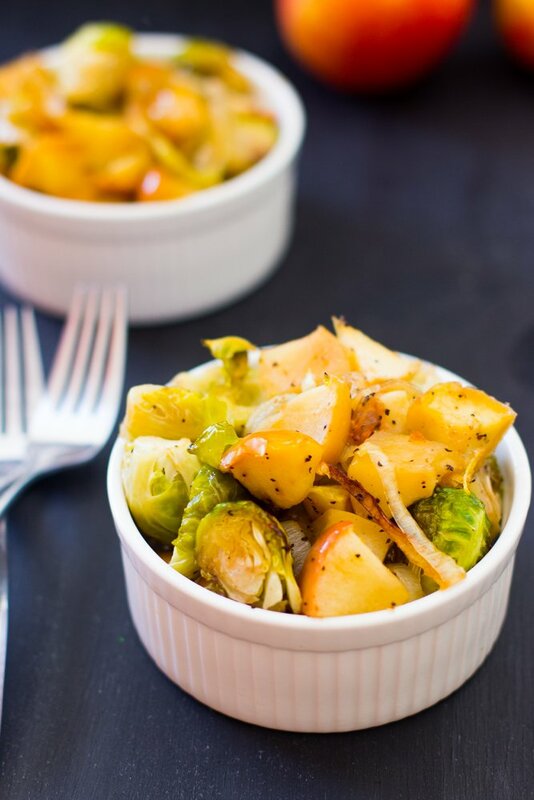 Maple Roasted Brussels Sprouts, Onions and Apples is a sweet and salty dish that brings out the amazing flavour of soft caramelised brussels spouts, onions and apples. I’m starting to believe I was blessed to not be introduced to brussels sprouts until I was an adult, because I fell in love with them on first bite. I think they taste good raw, but roasted, they are absolutely amazing. 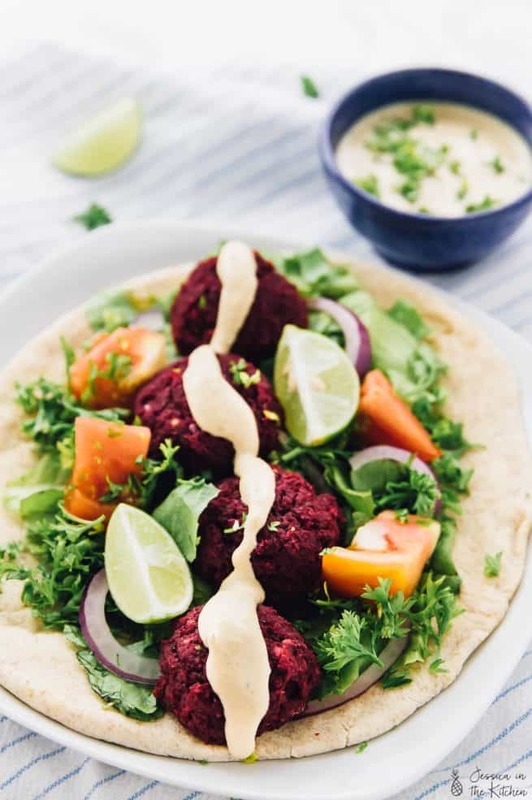 Recipes like this remind me that Thanksgiving isn’t that far away, and being vegetarian means I get to delve into a whole new world of side dishes and main courses for Thanksgiving. Needless to say, I’m pretty excited. 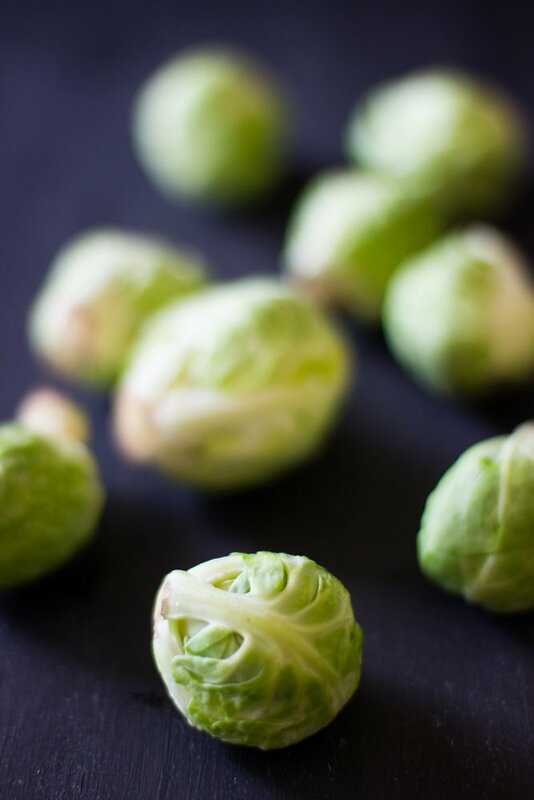 This recipe came from a desire to know what was so magical about roasted brussels sprouts that anyone you asked about them immediately referred you to that method of preparing these adorable vegetables. I’m definitely drawn to new experiences, and after realising that I could fall in love with kale so easily, I knew this was next on the list. Brussels sprouts seem like a double agent, like most vegetables, because they are so crunchy and hard raw but once roasted hidden flavours seem to come out alongside an absolutely beautifully soft but flavourful vegetable. To say I liked this dish would be an understatement – but then again, you know I would never share something I don’t love. The maple syrup seemed to kiss the brussels sprouts in such a way as to caramelise the vegetable so that it was almost like candy, healthy candy of course, but candy nonetheless. The contrast in the brussels sprouts of soft but slightly hard on areas that had been caramelised was very welcoming especially alongside the apples and onions. 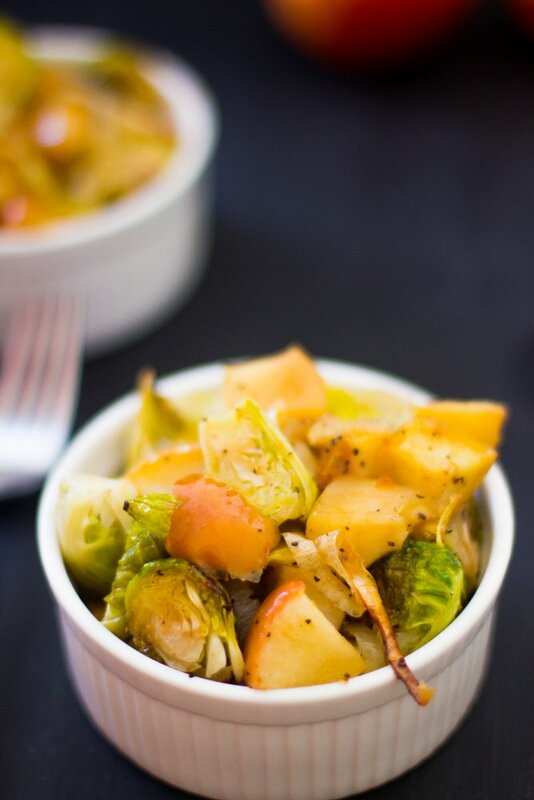 Speaking of apples and onions, when I began to prepare the brussels sprouts I realised I didn’t want to just give you a roasted brussels sprouts recipe, but to add some other fruits and vegetables that I love caramelised , and couldn’t stop eating. Apples become so tender and soft and packed with flavour, while the onions become sweet and slightly salty which is a flavour I would incorporate into every dish of my life if I could. They all worked so well together in this dish that as usual, I was so tempted to eat half of it that I ate so much before the shoot that I had to come up with a creative way of shooting what was left! 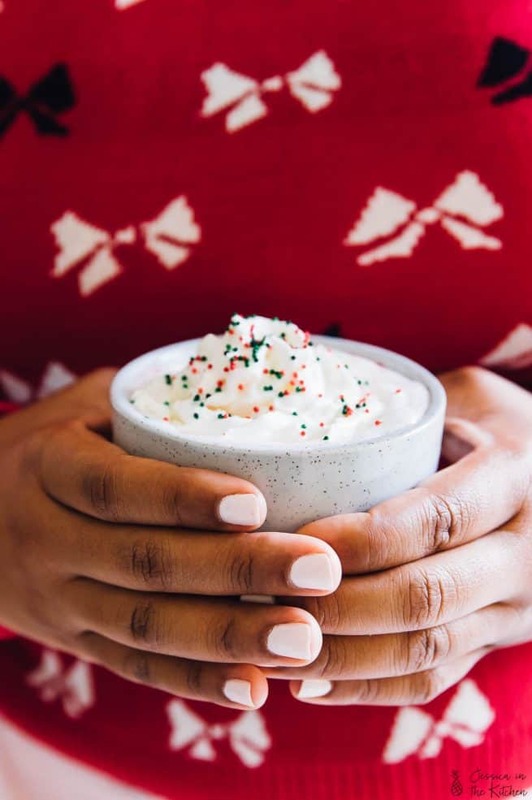 I promise you won’t regret trying this, and maybe it’s a bit early for Thanksgiving recipes but this one is definitely going into my arsenal for that day. And again, I’m pretty excited. Cut the brussels sprouts in half. 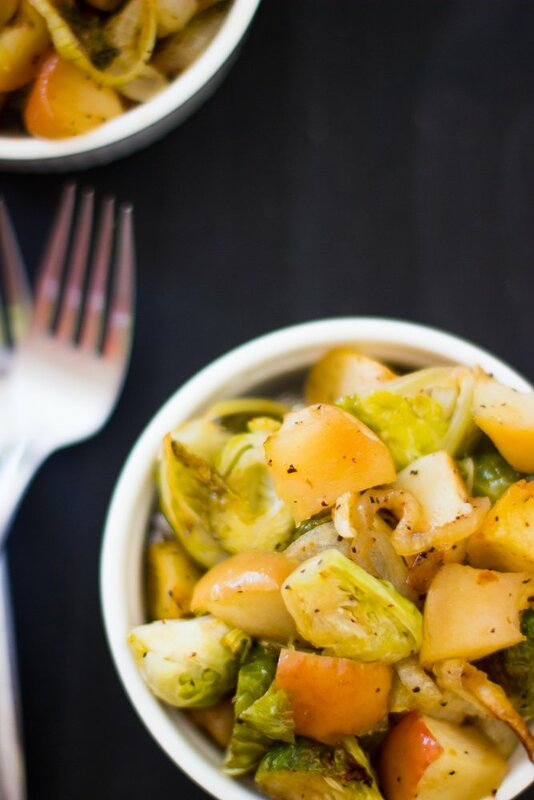 Toss the brussels sprouts, onions and apples together in a bowl. Mix the olive oil, maple syrup, salt and pepper together then drizzle over brussels sprouts mixture. Stir until everything is coated (add another tablespoon of maple syrup if you so desire) and place on a greased baking sheet. Bake for 25-30 minutes, stirring a few times while baking, until apples are tender, onions soft and brussels sprouts begin to caramelise. I would have never thought about pairing maple syrup with Brussels Sprouts! I like this idea! LOOOOVE all these fall flavors coming together! Another great post Jessica! Oh that is gorgeous. I’m wondering if it would make any sense at all to do this with a butternut squab instead of the apples (as a variation). Haha no problem! That could totally work!! You would probably want to add some more salt and pepper to the butternut squash. Thanks for commenting Margot! I love eating roasted brussels sprouts. And this combination with the sweetness of maple syrup, apples, and onions must be so good! Sweet and savory together is so addicting! I’m all over a new way to eat brussels, my fave! This is my kind of veggie side dish! Though, to be honest, I would probably eat the whole pan and call it dinner. Haha I totally did that! Thanks Joanne! I LOVE brussel sprouts. I hated them as a kid, but love them now. This sounds so, so good! I love me some brussel sprouts! 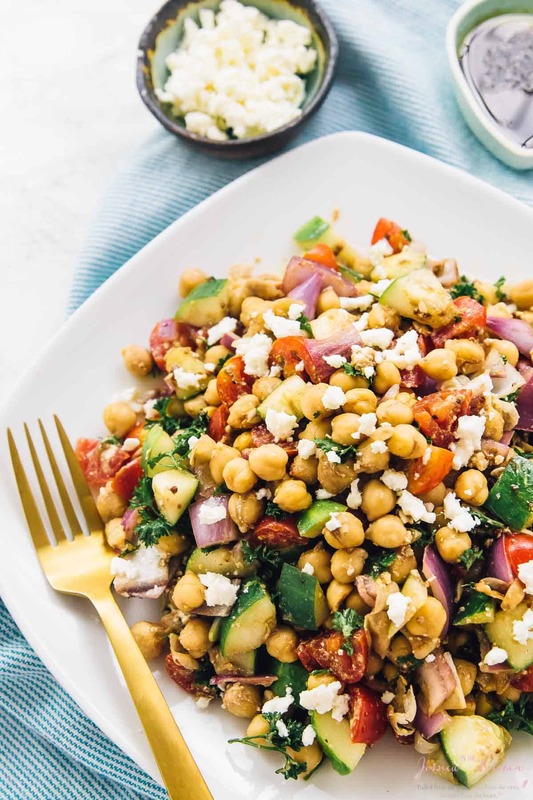 Perfect veggie side dish! Pinned!! I used to hate brussels sprouts as a kid too but now I love it especially roasted. Love all the fall flavors in this dish – it looks delicious! This was delicious! It gave a lovely, sweet twist to our Thanksgiving meal this year, and it’s gorgeous to boot. Thank you for the recipe! Holly genius recipe, Batman! I make sweet and spicy Brussels sprouts with maple syrup so I know those flavors are great but I’ve never thought to pair them with apples. My hubby’s been on a Brussels sprout tear the last couple of weeks so this is now on the menu for Tuesday. Thank you! You’re welcome Maggie and thank you! I hope he enjoys it and you too! I made this and it was delicious! It was actually my entire lunch and it was quite a satisfying meal. I never thought I would see the day that Brussels sprouts would be part of any meal I was willingly eating, let alone taking up the whole plate. Well done.